The Summit will showcase the actions that have taken already to reduce their emissions; secure bold commitments to do even more, show that decarbonization; job generation and resilient economic growth go hand in-hand and galvanize a global movement for climate action that leaves no one behind. This is a moment to celebrate the extraordinary achievements of states, regions, cities, companies, investors and citizens with respect to climate action. It will also be a launchpad for deeper worldwide commitments and accelerated action from countries—supported by all sectors of society—that can put the globe on track to prevent dangerous climate change and realize the historic Paris Agreement. Participants will not only share what they have achieved to date, they will also commit to doing more to usher in the era of decarbonization, greater levels of sustainability and prosperity for the many rather than the few. These actors will celebrate a range of new climate commitments under five key areas: Healthy Energy Systems, Inclusive Economic Growth, Sustainable Communities, Land Stewardship and Transformative Climate Investments. The Global Climate Action Summit looks to the future as it is happening midway between Paris 2015 and 2020. It is timed to provide the confidence to help governments to ‘step up’ and trigger this next level of ambition sooner rather than later. The momentum generated this year must lead to bending the curve of emissions down by 2020—science advises us that this is gives the world the best opportunity to prevent the worst effects of climate change. 2018 therefore must be the beginning of a new phase of action and ambition on climate change. The Healthy Energy Systems challenge focuses on the global clean energy revolution that is decarbonizing energy and transport systems and enabling healthy people and places. The Inclusive Economic Growth challenge focuses on business climate leadership, and how bringing everyone on board can generate good jobs, spur global development, and leave no one behind. The Sustainable Communities challenge focuses on sustainable buildings, cities, communities and infrastructure that are clean, healthy and livable, and improve quality of life for all. The Land and Ocean Stewardship challenge focuses on acknowledging the role that forests, food, lands and other ecosystems must play in mitigating climate change and making our world more resilient, while also ensuring sufficient food supplies for a growing population. The 30X30 Forests, Food and Land Challenge calls on businesses, states, city and local governments, and global citizens to unite and take action for better forest and habitat conservation, food production and consumption practices, and land use to deliver up to 30% of the climate solutions necessary by 2030 to tackle the climate crisis. Learn more and get involved at ClimateLandChallenge.org. The Transformative Climate Investments challenge focuses on mobilizing investment on an unprecedented scale, to achieve the goals of the Paris Agreement, to spur innovation, and to accelerate a clean and resilient economy. The Global Climate Action Summit will bring leaders and people together from around the world. 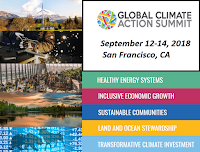 At the Summit, international and local leaders from states, regions, cities, businesses, investors and civil society—known as “non-party stakeholders/non-state actors”—will be joined by national government leaders, scientists, students, nonprofits and others in a new wave of mobilization. These critical agents can not only help unleash the opportunities from climate action but they can also catalyze the world's Presidents and Prime Ministers to go further and faster too. 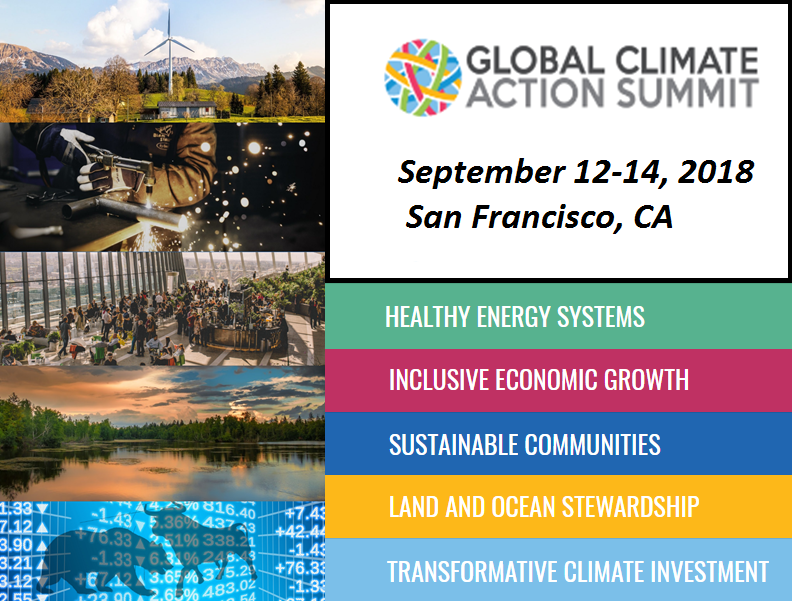 People everywhere are encouraged to participate in the hundreds of affiliate events taking place in the San Francisco Bay Area and throughout the world during the week of September 10-14th, including climate action panels, workshops, tours, exhibits and other special events. The full affiliate event schedule will be posted here this summer. You can virtually attend the Summit by streaming it live on YouTube, Facebook and Twitter. In person, Summit attendance for the plenary and other high-level sessions is by invitation and will require accreditation.